We begin Colossians. Pondering Paul’s greeting. “Paul, an apostle of Christ Jesus by the will of God, and Timothy our brother, To the holy and faithful brothers in Christ at Colosse: Grace and peace to you from God our Father” (Colossians 1:1,2). Paul’s introduction (“an apostle of Christ Jesus by the will of God”) is familiar, but audacious. Sent by the authority of Messiah Jesus? The Jesus crucified almost 30 years ago? Sure, resurrection rumors recur. But most think them just that. Yet, here’s Paul claiming to authoritatively represent him–and this “by the will of God”! So, we’re obliged to listen. While Paul’s a prisoner in Rome, Timothy is with him. 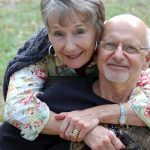 The younger man occupies an increasingly important place in Paul’s life and ministry. In a few years, Paul will write two letters to Timothy, the latter the last we have of Paul’s letters. Here Timothy is his “brother”, both in the faith and in the mission. Paul addresses ” . . . the holy and faithful brothers in Christ at Colosse”. ” . . . holy” is the NIV’s translation of the Greek hagios. Many Bible versions translate this “saints”. ” . . . in Christ” ; that is, their union with Christ by faith and the Spirit, sets them apart to Christ. They are “faithful brothers”. Though commentators are divided whether pistos should be translated “faithful” or “believing”, “faithful” better suits the context, because a problem is growing in the Colosse church. Gnosticism, though not an organized system of belief until a hundred years later, is already influencing thought. The doctrine taught that the world was created by Christ, who was a lesser deity and an emissary of the far-off divine being. “Insider” knowledge (gnosis) of him brought redemption to the human spirit from the evil material world. To the church, the danger was not rejection of Christ, but a diminishing of him. To counter that, Paul boldly writes of Christ . . .
“He is the image of the invisible God, the firstborn over all creation. For by him all things were created: things in heaven and on earth, visible and invisible, whether thrones or powers or rulers or authorities; all things were created by him and for him. He is before all things, and in him all things hold together. And he is the head of the body, the church; he is the beginning and the firstborn from among the dead, so that in everything he might have the supremacy. For God was pleased to have all his fullness dwell in him, and through him to reconcile to himself all things, whether things on earth or things in heaven, by making peace through his blood, shed on the cross” (Colossians 1:15-20). ” . . . faithful”, then, is Paul’s way of encouraging the believers who hold fast to the gospel of Christ, not mixing in gnostic ideas. 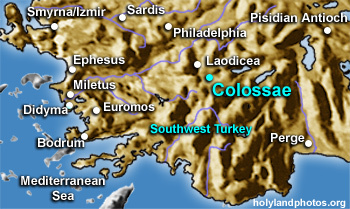 Colosse sat about 100 miles east of Ephesus in Asia Minor. It was part of an important trade route that included the cities of Hierapolis and Laodicea. Once a large, populous city, Colosse had become a small town when Paul writes to the church there. The town was largely Gentile. But estimates of a Jewish population reach as high as 50,000. “Grace and peace to you”, as always, isn’t just first-century-letter-form. It’s Paul’s blessing for the church–that the church might enjoy a greater abundance of the Father’s unmerited favor in Christ and, from that, enjoy fullness of well-being from him. With that, Paul’s greeting to the Colossians ends. “Grace . . . to you”. A welcome blessing pronounced. A greater gift of grace. The Father’s unmerited favor. Love undeserved. Sins forgiven. A grace greater than our sins. Estrangement reconciled. Sufficient power perfected in weakness. Embrace of us who are nothing by the One who has the supremacy in all things. And, therefore, . . .
” . . . peace to you”. Reconciled to the holy Father by the blood of the Son shed on the cross. War ended. Sinners surrendered and welcomed. Distance bridged. No sin held against graced sinners. A pervasive sense of well-being in the soul.